The ASUS Chromebook Flip C101 is a new convertible notebook that will cost 299$ only but comes with a relatively premium build quality. In fact we’re mostly getting an aluminum body here. It’s a 2 in 1 design with a rotating touchscreen and not the best internal hardware. It seems fine for Chrome OS though and the tablet mode is especially interesting since we’ll be able to run Android apps from the Google Play Store. At Computex 2017 I had the chance to play around with the new ASUS Chromebook Flip C101. Here are my first impressions – tell me what you think of this convertible in the comments below! Obviously the design of the Chromebook Flip C101 is not the best, look at the cheap price. But the build quality is surprisingly good. Except for a small plastic cover around the hinge everything is made out of aluminum which feels quite nice. From the build quality alone you might think you’re paying at least 500 dollars. The design itself looks quite old though – there’s a huge bezel around the display. During my short time with the convertible I could type on the keyboard quite nicely. For a 10 inch device the keyboard is pretty big. The touchpad is solid, nothing special though. Above the display sits a webcam, we’re getting two USB Typ C ports, a big USB 2.0 connector and a microSD card slot. The internals are nothing to brag about but fine for its price. The 10.1 inch touchscreen is an IPS panel with a HD resolution at 1280 x 800. Underneath sits a Rockchip RK3399 chipset which is a hexa core processor made up of two Cortex-A72 and four Cortex-A53 cores. We’re also getting 2GB to 4GB of memory and 16GB to 32GB of internal storage. It seems like ASUS is not planning to release a 4G LTE version. Even though the specifications sound quite boring I was able to use the ASUS Chromebook Flip C101 without any problems. As you can see in my video it’s easily possible to open a couple of tabs in the browser without getting any lag – even when opening one YouTube video after another. That’s usually not possible with a Windows tablet with an Intel Atom x5 Z8350. 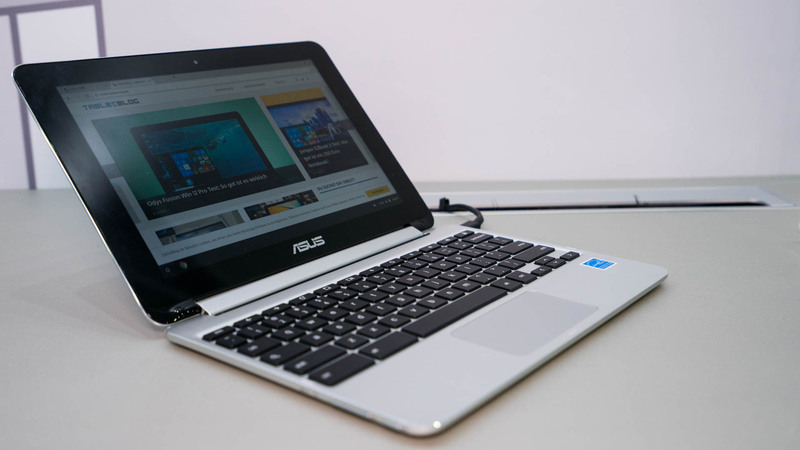 My first impressions of the ASUS Chromebook Flip C101 are pretty good and I would love to spend more time with it. The build quality is quite nice for the price and the internal hardware seems good enough to run Chrome OS without any noticeable lag – well, at least as far as I could tell so far. What do you think of it? Samsung Galaxy Tab S3 Review: The Best Android Tablet?